I have recently purchased a K5 to upgrade from my K3 and have noted that the vacuum port on the k5 is impossible to get a vacuum hose on it due to it being so close to the assembly. The port I had to purchase separate for my k3 was farther out from the body of the jig and would allow a vacuum with no problem. Is anyone else have this problem? With the swivel ability of the new dust collection port you should be able to maneuver it to allow you to properly attach your dust collection. Is there any way you can post some pictures of what you are referring to. This way I can get a better idea of the problems you are having. I think I have discovered the problem but not sure what everyone else is doing. It appears that my vacuum connections are just too large to fit in the opening and too small to fit over the nozzle. It appears I need to find a smaller section of hose or a fitting to slide into the vacuum port on the jig. I will tell you that our dust port is designed of of the dimensions of a 1 1/4" Shop Vac brand hose. They do have adapters to accommodate generic hoses and connections as well. I have also seen customers using duct tape to make up the gap in these connections. I will reply. First let me say I am a big fan of Kreg products and I own several. Now I regretfully must say the dust port on the K5 is a big fail. In fact, I can't believe it passed any kind of consumer test prior to market. The pipe is too short for any connector to gain purchase and it is too close to the K5 body so there is no clearance. It would be easy for anyone to compare the K5 to the previous models to see the difference. I like that it swivels, but if it was just a 1/4" longer the problem would be solved. It would clear the end of the K5 vertical stack and provide enough length to attach a hose or other connector. In fact, it would be about the same length as the previous model. I just don't get why Kreg decided to make it shorter? This is the kind of design flaw that drives customers nuts and tarnishes a company's reputation. You should make a replacement dust connector. I'd buy it in a heartbeat. The issue you are referring to is due to your dust collection hose trying to attach over the outside of the dust collection attachment. It is designed to go inside of the opening allowing the friction of this joint to hold it in place. If you go to https://www.kregtool.com/store/c13/kreg-jigsreg/p36/kreg-jigreg-k5/..., at about the 28 second mark you can see them attaching the dust collection hose to the K5 as I have described. The older ShopVac brand hoses with the 12" solid ends are all you need for the K5. They slip right into the port on the K5 & pull all the chips out. I've never had a problem with mine using that older hose. I also have it hooked to a small ShopVac so when it's running I can still move the board easily. I started a big kitchen cabinet project and all joinery is made with kreg screws. I own the K5 and did try (struggle) to use the dust collection.In my opinion the attachment is poorly designed, too short and detaches easily at the slightest hose vibration or movement. There are 2 very small tabs on each side that holds the shroud in place on a groove but can't keep up with the vacuum hose no Mather the way you help hold the hose steady. I really enjoy my K5 jig but the vacuum attachment needs a total redesign. My DC setup for the K5. Like I mentioned before the smaller shop vac gets everything out on every hole every time. There's not enough vacuum to make moving the piece hard yet it does a fantastic job. 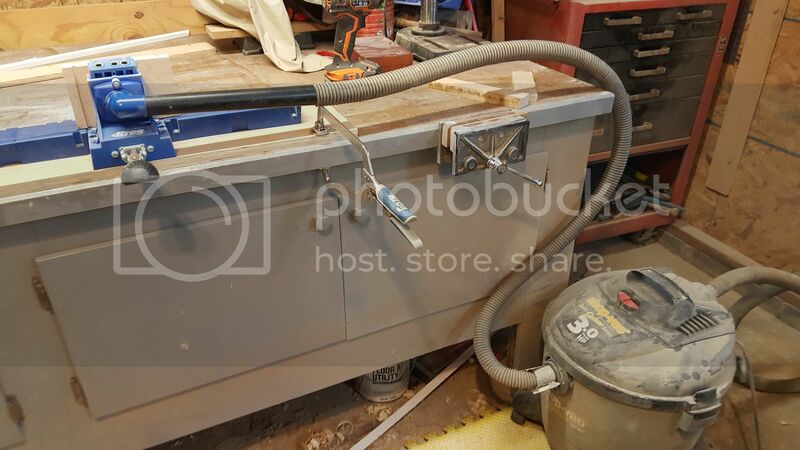 I am using a Sears canister vac at my basement workbench/Kreg station. I removed the extension from the nozzle and have a “gas pump” like handle that presses perfectly into the adapter. The handle gives me really good control of the jig when moving longer boards. Having said that, the Central vac unit in my garage mates to absolutely none of my power tools. ABS pipe and duct tape. Costco was selling a mini-vac by Porter-Cable for awhile that fits the K5 vacuum port. Good day, I just bought the K5 master system and the dust collection port works great. I have my ridgid shop vac hooked up and it leaves no shavings from the K5. I see some people must be having issues or this post would not exist, so I thought I could post a photo of the connector I use. I purchase the part at my local Home Depot, but I know that Lee Valley does carry the nozzle for the dust port in Canada for $3. My hose though is 2 1/2" that this fitting is intended for. In the hose extension kit I purchased years ago, it had the "orange" fitting that allows you to connected it too the vac hose and the black adapter would attach to this male (orange) to female (black) adapter.